Exactly Who is Getting Paid What? Not every athlete has THAT contract. Not every athlete is Alex Rodriguez…or Sam Bradford as a rookie. The league minimum in the National Football League (NFL) is currently $325,000. This of course goes up with each year of experience, so the highest minimum salary paid is $860,000. 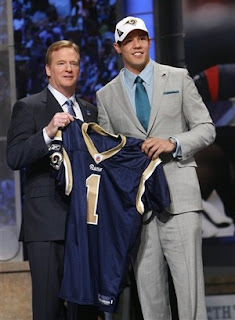 Though this is a solid bread winning…it is far from the contract of 2010 first round draft pick Sam Bradford with the St. Louis Rams. Bradford signed a six year $78 million contract with $50 million guaranteed. Major League Baseball (MLB) is home to some of the largest contracts in sports history. Alex Rodriguez signed a 10 year, $275 million dollar contract with the Yankees back in 2008…the largest MLB contract to date. Joe Mauer, short stop of the somewhat conservative Minnesota Twins, will begin his eight year $184 million contract in 2011 (well worth it to seal his stay in the Twin Cities if you ask this Twins fan!) Yet the average MLB salary in 2010 was 2.5 million with a minimum of $400,000. A game of exorbitant salaries yes…yet it till seems like uneven distribution of compensation. If you go down the rungs of the minor leagues you will notice YOU make far more than these boys! Though if one is lucky enough…and I do mean luck…to gain a spot on a 40-man roster as a minor league ball player for two years or has one day of major league service, a salary of $65,000 is earned. We think of athletes as excessively paid…frivolous, sickening contracts. Is the league minimum still considered excessive? Do we as fans even know that some of our favorite athletes are receiving a minimum salary? Do we generalize without knowledge of who is actually getting paid what?